Kill it on Turkey day with a fresh side that goes with everything, takes 10 minutes to make, and will WOW your guests. Snack Girl is not joking. One Thanksgiving, I made this salad and got more compliments on it than the turkey that I slaved over. And, yes, I learned something. It tastes like anise and has the same consistency as celery. It is SO delicious when combined with citrus. The flavors complement each other to give this sweet and crunchy salad that will provide a respite from the heavier food on your table. You can add a little vinegar or you can skip it. To save time on Thanksgiving, slice the ingredients a day ahead and then put in a bowl in the fridge. When you are ready to serve, add the vinegar, taste, and decide if it needs salt or anything else. There is no doubt that this salad will be the least calorific food on your table. Also, it makes a great snack. You can make a bowl of it and just serve yourself some any time or toss into a container for your lunch box. Do you have any last minute T-Day ideas? 1. Slice the fennel. Trim the ends, quarter lengthwise, core, and thinly slice. Chop 1/4 cup of the green fronds for looks. 2. Slice the oranges. Using a cutting board that captures juices, slice off both ends of each orange. Cut away the peel and the white pith so you are left with the ORANGE of the orange. Halve orange from top to bottom; thinly slice crosswise. 3. 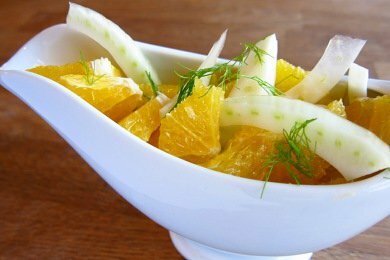 Place oranges and fennel in bowl with juices that accumulated on cutting board. Store until ready to serve. At serving time, mix in vinegar and salt to taste. Sounds good. Where did you get fennel bulbs? My grocery stores don't carry stuff like that and my co-op doesn't stock it either. Did you grow it yourself? @T - my grocery store had them - Stop and Shop - but I live in MA where this is local and in season. I'm sorry you can't find them. 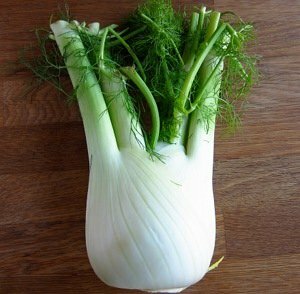 This may be a silly question, but I've always been very intimidated by fennel... do I use all of the white part (the bulb, I'm guessing)? Also, what does it taste like? Is it bitter? Do you think this would be good with clementines? @Leah -I think it would work but be more difficult as clementines are smaller and so you have to cut up more of them to have enough. @ Sarah - yes! It is intimidating. It is not bitter - it is like a combination of licorice and celery - and it isn't strongly flavored. I found a REALLY boring but informative video of how to clean fennel. Do not use all of the bulb - core it - you will see the core at the bottom of the bulb. I hope this is helpful! Just today I resolved to forgo the Trader Joe's pumpkin cheesecake for some fresh navel oranges for Thanksgiving dessert. Sadly this was a bust at Thanksgiving. I didn't like eating the fennel as a salad. It had the consistency of celery (not a good thing in my family) and even though the taste was better, it wasn't any fun to eat. Oh well...The naked apple pies were fabulous.